Photograph taken at the Bowser grade crosssing near the Island Highway on mile 115. 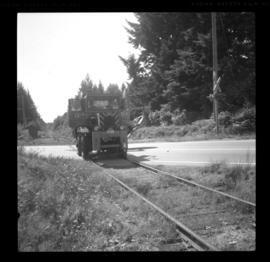 The railroad brush cutter worked north from Nanaimo. It was doing one sweep fairly close to the track and was especially needed in area of rapid growth. Photograph taken at the Island Highway crossing in Bowser on mile 115. 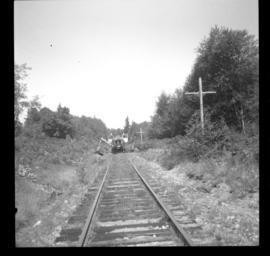 A railroad brush cutter was working north of Nanaimo. Photograph taken on mile 105. Image captured looking towards the north. 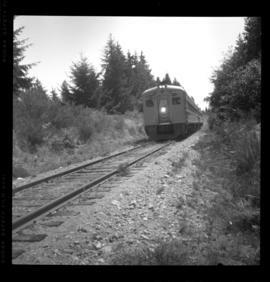 A daily passenger train of 2 Budd cars is passing. 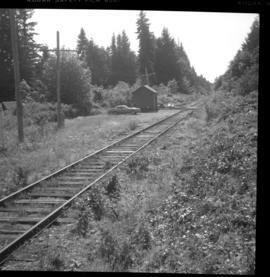 Photograph taken where the Island Highway in Bowser crosses the Esquimalt & Nanaimo Railway at approximately mile 115. 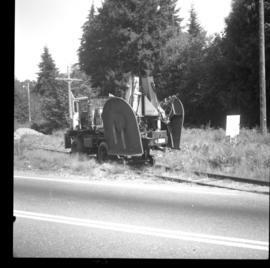 A brush cutter had just passed over the grade crossing and was just behind the camera. Photograph taken in Bowser, BC. 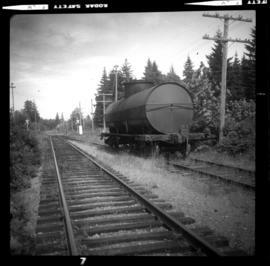 A tank car belonging to Procor Ltd., built in 1923, standing on a passing loop is visible. The tank was used by a local fuel oil supplier.